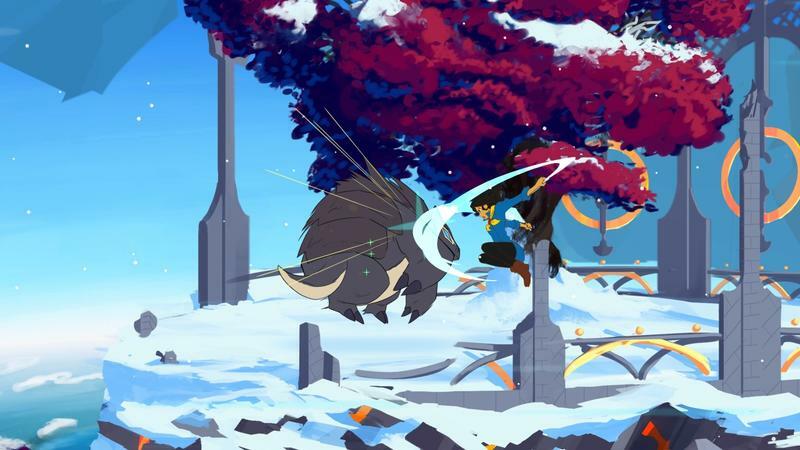 What drew me to Battle Chef Brigade initially back before its Kickstarter campaign in 2014 was its art style. Visually, the game simmers in a league of its own thanks entirely to its unique design sense, the work of contract artists and Eric Huang. Then I read about the premise. Back then, the idea was loose and fluid. Generally, you’d hunt monsters for ingredients, collect them and then somehow cook up a dish to be judged in a cooking contest. I’ve now played the game for the first time at PAX East, and it’s a blend of 2D combat and puzzle solving. It works, you know? “It’s like two games in one,” Trinket Studios’ Tom Eastman told me after I played. It is, too. During the brief demo, a few key things happened that I believe inform me about how the game will generally play out once it hits the buffet table. You’ll challenge a chef to a cooking competition, you’ll be introduced to a judge, the contest’s theme ingredient is announced and then the game begins. The whole world is set in this 2D style, whether you’re cooking or killing. You’ll start by dashing out of your kitchen to go on your murdering spree. Our demo required Dragon Meat as the key ingredient. That meant, in addition to hunting a host of other small animals, I had to set my sights on the dragon on the far left of the 2D demo and render him sliced and diced. 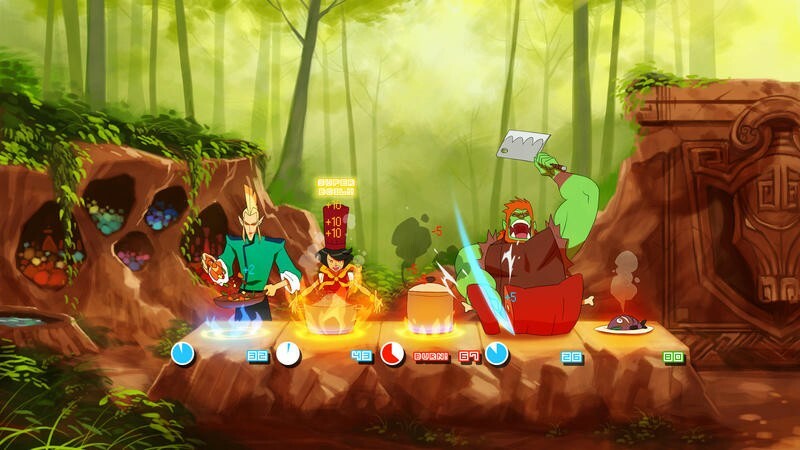 As of now, the combat section of Battle Chef Brigade is simple, straight forward and easy as pie. You have magic attacks and melee attacks. I played on a PC with an Xbox 360 controller, so jump was mapped to A, melee to X, dodge to B and magic to Y. Pressing up or down in addition to the button in question performs a different attack, too. So, you can totally magic and melee through small sections of monsters, comboing, uppercutting and dodging your way to their precious meat. You collect the ingredients and head back to the kitchen. This is where the second of the two games in one boils into play. Cooking. 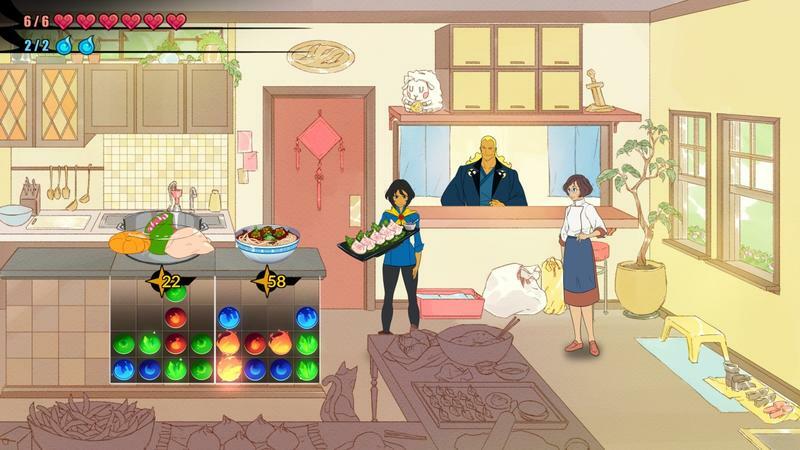 Cooking has been a challenging part of the design process since the onset of Battle Chef Brigade‘s development. Eastman told us that they prototyped all sorts of methods before settling in on what I’m about to describe. The biggest problem? They’d often over-season the puzzle system with too many mechanics. This developers are cooks. They appreciate cooking in such a way that their passion for the practice steams almost too much into the game. They tried to approach the cooking segments with too much chemistry, mouthfeel and flavor requiring the users to play too slowly, often sucking the fun and pace out of the moment. Over-design has been an issue. So, the Trinket team decided to scale things back. The cooking system is a gem matching game. The colors and combo speed affects the taste of the dish, and certain judges will want certain tastes to really be highlighted in the final version of each recipe. I monster judge in this fantasy game, for instance, might want their dish poisoned. Even further, once the game evolves beyond the easy bits we played, chefs will have to contend with recipe thwarters like mold and bone, both of which add unique layers to the matching puzzle. Tom told us that bone, for instance, can’t be moved. Sounds tough. Cooking happens on the fly. You’ll find your dragon meat, bring it back, get it from your pantry and toss it into the pot. Each ingredient falls into the pot as a different configuration of gems. In a sense, you’re baking your own puzzle as you drop these ingredients in with their own gem layouts. Adding ingredients means adding gems, and each pot, pan or oven features its own matching mechanics. You stir in a pot, right? So stirring the ingredients means rotating the gems to match them. In an oven, for example, the ingredients might be matched by flipping instead of rotating. 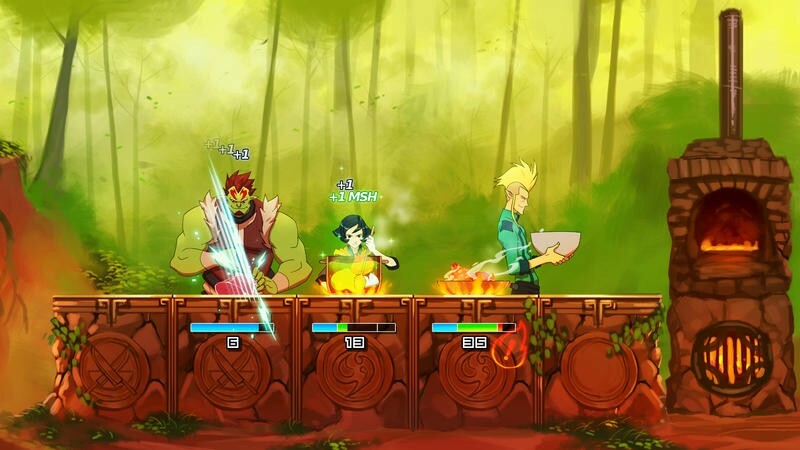 Battle Chef Brigade, then, offers a host of different gameplay mechanics wrapped up in a single package. There’s the 2D action, and then there’s puzzle solving. The puzzle solving, thanks to all the different cooking vessels, offers unique puzzle mechanics throughout. It’s a lot to taste all at once. The music, art and smooth feel make it a game I’m excited to master, and I think backers will be happy with the product Trinket is developing. They’re saying it should be out in early 2017, but remember this is a small team with a group of contractors. The game they set out to make and the one they’re winding up with are almost two different beasts. Listening to Tom today, it was obvious that the team has been so excited to include new features and improve upon the ones they have, that this has been a pure labor of love. It is still, however, a labor. Expect the work to continue and the game to change even more. 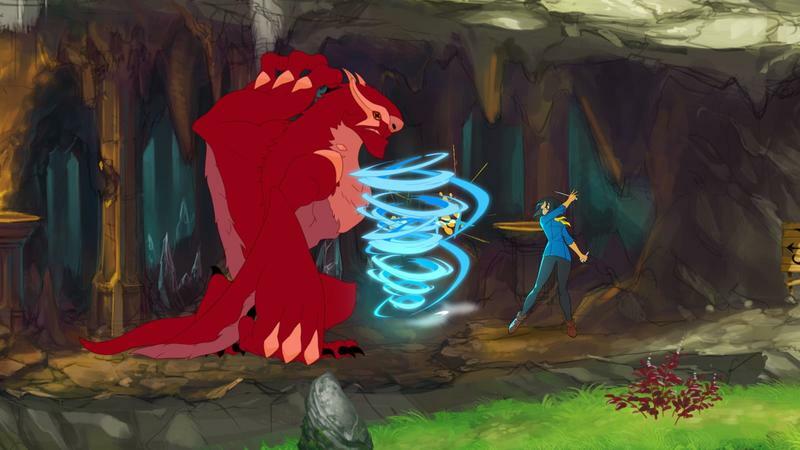 So far, Battle Chef Brigade looks delicious.